The upper river is in excellent shape and is very easy to wade. Although the fish will still come up and eat smaller flies on the surface, nymphing some of the deeper runs and pools is beginning to prove more effective. We have had good streamer fishing reports from the upper river at Hayden Meadows. There is no need to get started early in the morning here. The middle river is fishing well, but crossing the river is not recommended until flows get down below the 500cfs mark. The fish are definitely holding consistently in or near deeper water as temperatures cool down. Midges are becoming more important, particularly subsurface. At these flows, do not be afraid of tying on smaller patterns. Midges as droppers in the morning behind a stonefly nymph have been productive and mayfly nymphs in sizes 16 to 18 work well through the afternoons. The key is finding the right water. At these lower flows, fish are dispersed away from the shoreline throughout the riverbed, so anglers should spend more time picking apart likely lies out towards the main current and adjusting dropper depth until the fish are found. The water temperature at Martin Lake is currently around 43 degrees. Recently, visitors have been catching some nice size catfish. While the fishing for other species has tapered off, the fishing can still be good depending on the time of day and location. The trout and sunfish will gather around structures and will move up and down in the water column as the day warms and cools. Finding structures to fish around is key this time of year. The northern pike will be active on nice days this time of year during the warmest part of the day between 2 p.m. and 4 p.m. During these times, pike can occasionally be persuaded to take top water baits, making for some exciting hits. The water temperature at Horseshoe Lake is currently around 44 degrees. The lake is closed to boating for the season, but shore fishing remains good. The current water temperature is around 50 degrees. The fishing from the south shore has been decent. A majority of the fish are being caught around the lake with worms and PowerBait. Reilly canyon, where the river comes in is fishing slow, but some anglers are catching some small perch and decent trout. Boat anglers have been catching mostly trout and walleye. Worm harnesses and trolling less than 2mph have worked in water depths around 20 feet. The current water temperature is around 62 degrees and slowly dropping as the days are shorter and the nights are getting cooler. 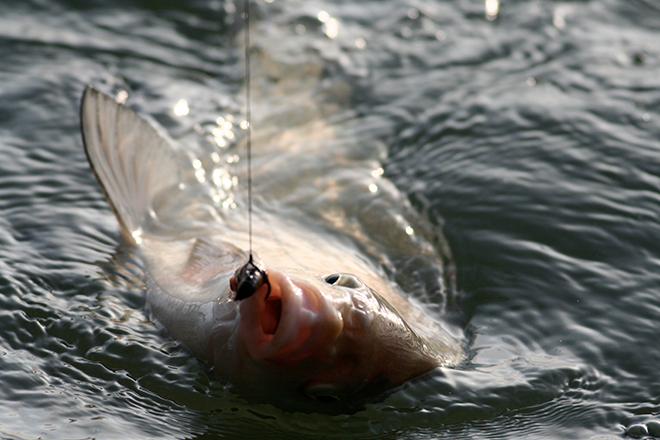 The fall bite is starting to pick up, as fish will move up to shallower water in pursuit of shad. The fishing has been fair to good lately. The bass fishing is picking up as the bass are gorging on shad. The walleye fishing has been fair to good with a few smaller walleye beginning to move up into shallower water chasing shad. Grubs and small crank baits will produce bites for walleye in shallow water. There have been a few reports of trout being caught on PowerBait from the shore. There have also been a few reports of trout being caught trolling throughout the lake.